The table INDX contains data that is packed in binary form and usually compressed so that it cannot be displayed directly. Under certain circumstances, the table may contain a lot of records, and you want to know whether you can delete certain entries. The data in the table INDX and other tables similar to INDX are written and read using the ABAP commands EXPORT TO DATABASE and IMPORT FROM DATABASE. This data is usually compressed, and you can store any data (for example, large internal tables). If the data structure changes, or if the content of the table is corrupted in any way, you can no longer import the data in most cases. You can use the field RELID, which is always contained in the key, to roughly delimit the table contents of INDX tables. This two-digit ID is always specified in parentheses directly in the EXPORT command. Example: EXPORT ... TO DATABASE INDX(XY). For what data can the table INDX be used. The INDX table should be used only for storing load objects, that is, for data that can be reconstructed after data loss. Original data that cannot be reconstructed should not be stored in the table INDX. 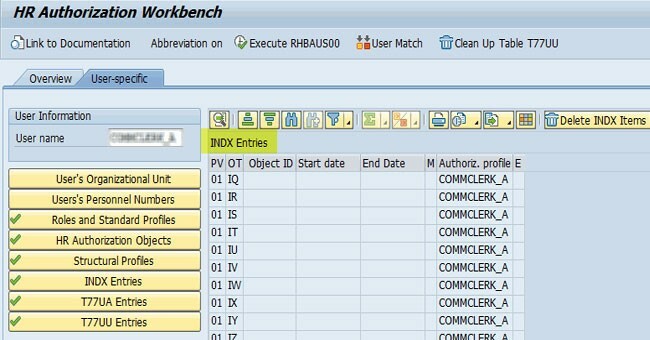 In general, we recommend that all applications that use INDX data create their own INDX table. This facilitates an easier identification of the application to which the data belongs. In addition, this reduces the risk of two different applications storing their data under the same RELID and data being merged or overwritten. The following lists some frequently used RELID values of the table INDX. In some cases, notes regarding the reorganization or display of the relevant data exist. Generally, questions regarding the reorganization of certain entries (RELID) can only be answered by the applications component that stored the data.